Product #46125 | SKU LEOSWITCHKIT | 0.0 (no ratings yet) Thanks for your rating! 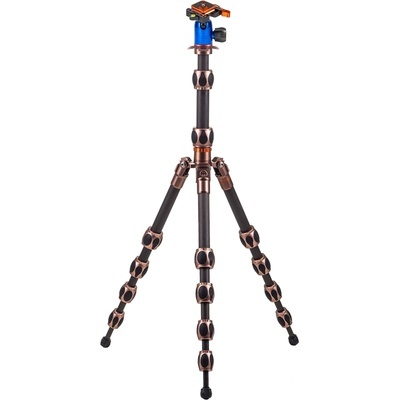 Featuring five leg sections and two column sections, the compact Leo from 3 Legged Thing is a micro-traveller tripod providing professional functions for your photo and video applications. The Leo can be adjusted between a low-level angle of 12 cm and maximum height of 1.3 m, and fully folded at a length of only 35 cm, which can fit in many carry cases and secured to many messenger bags. The included ball head adds another 9 cm to the Leo, bringing the total maximum height to 1.4 m. The Leo also has a detachable leg that you can use as a monopod, mic boom, camera boom, or selfie stick. The detachable leg has a 3/8"-16 thread on each end. The Leo weighs only 1.5 kg and supports up to 30 kg when set up at a 23° leg spread, which is considered normal. At 55° it supports 20 kg, and at 80°, 10 kg. The two-section centre column can also be inverted, so that you can have the camera mounted upside-down, as low to the mounting surface as you wish by lowering the tripod height, or you can raise the tripod height. The centre column has a 3/8"-16 mounting screw on it, which can be removed and instead secured into the 3/8"-16 threads on the detachable leg. Otherwise you can attach the included ball head onto the screw (or optional tripod heads). The included Equinox AirHed Switch Ball Head has an 36.7 kg load capacity, Arca-type compatible quick release mechanism, rubber-padded camera plate with a 1/4"-20 mounting screw, 3/8"-16 tripod mount thread on the bottom, bubble level, and ergonomic tightening knob on the side. The Leo includes standard rubber feet but also supports optional 3 Legged Thing spiked and claw feet. The Leo employs 3LT's ParaLock lock system, designed to prevent accidental disassembly and provide additional stability and better grip. The Leo is made from 100% Pure Stealth Carbon Fibre, which consists of eight layers of tightly woven carbon. It's constructed with a focus on optimum weight-to-strength ratio. Its furnishings are precision-milled from aircraft-grade magnesium alloy.